The love stories continue with tales of adoration from the Kennedy’s. Jackie Kennedy captivated the nation as the First Lady in the early sixties. She was a fashion icon and every woman in America followed her style. Sixty-five years ago John Fitzgerald Kennedy married Ms. Jacqueline Lee Bouvier in Newport, Rhode Island. This star-studded affair went down as the social event of the season and the wedding of two of the most iconic political figures in American history. In May 1952 at a dinner party in Washington DC, photographer Bouvier was introduced to Congressman John F. Kennedy. The introduction was made by a mutual friend, journalist Charles Bartlett. John was apparently instantly smitten. “I’ve never met anyone like her,” he said at the time, The Washington Post later reported. The couple had been dating for two years when he popped the question with a Van Cleef & Arpels ring set with a 2.88-carat diamond and 2.84-carat emerald, according to Vogue. Jackie had the sparkler redesigned after their marriage. The baguettes were replaced with round diamonds totaling 0.66 carat, and marquise diamonds, totaling 1.46 carats (right). Eve has long been enamored with emeralds. In her Pompeii series she mixes emerald beads with 20 and 22 carat gold elements utilizing a granulation technique. Pompeii was a resort town in its day with beautiful villas looking out over the sea. 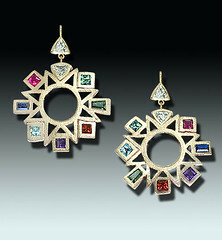 “Wealthy Romans vacationed in Pompeii and opulence was on display in their homes and in their jewelry. The Romans loved emeralds and gold. These elements have been popular since 70 B.C. ” explains Eve. “Via dell Abondanza” necklace. 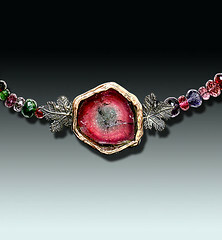 Delight your loved one with this alluring necklace from Eve’s “Pompeii” series. “Via dell Abondanza” necklace features 60 emerald beads totaling a hefty 71.0 carats, with 20 karat gold and 22 karat gold elements. $4030. “Etruscan Gold” earrings feature ornate 18 karat and 22 karat gold, with two emerald beads totaling 3.15 carats dangling below. Beautiful, elegant earrings can be worn day or night! $1970. One of the most famous pieces from Jackie’s collection was probably the least worn of all of her jewelry. That was the beautiful 40-carat marquise Lesotho III diamond ring given to the elegant brunette by Aristotle Onassis in 1968 when she agreed to be his wife. It’s believed that she only wore the marquise-shaped sparkler twice and then it was locked away in a bank vault in New York. It sold for $2.59 million during Sotheby’s 1996 auction of Jackie’s estate. This was much higher than the estimated price of $500,000 to $600,000 – but the price shot up due to a frenzied war between two anonymous bidders. Finding something special in Paraiba tourmalines, Eve has created the spectacular “Interchange IV” engagement ring. Several years ago she discovered these bright, beautiful Paraiba tourmalines from Brazil and set them in this ring. 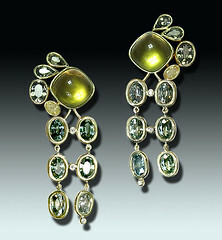 These tourmalines are now highly sought after and found in the house of Cartier as well as other famous jewelry houses. The center teal indicolite tourmaline warms the 113 diamonds surrounding it as though it is melting the ice. “In this society where everyone is on their cell phone, this is a reminder that there is warmth amid the cold atmosphere” states Eve. Swirling spirals of diamonds will hypnotize you in “Interchange IV”, an engagement ring from Eve Alfillé’s “Alone Together” series. The ring is an absolute beauty, featuring a 4.33 carat fine cushion-cut teal indicolite tourmaline encircled by a series of 113 diamonds totaling 0.87 carats (E-F/VS) that weave a swirling perimeter about the richly hued center. A pair of Paraiba tourmalines in an electric-teal hue sparkle on either side of the center stone and weigh 0.29 carats together. The theme of the “interchange” in this series signifies the various paths of life that we are all offered and the power of choice that we are afforded. $12,400.